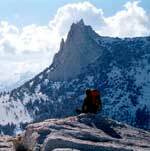 Cathedral Peak: a Tuolumne gem. In summer, when the Valley is hot and crowded, many climbers head to the cool temperatures and exceptions climbing in Tuolumne Meadows. At 9000', Tuolumne has the distinct and magical presence of the High Sierra. From enormous domes and mile-long exposed ridge traverses to bouldering and steep face climbs, Tuolumne has it all. Below are more than enough classic climbs to fill any extended road trip.